Based on the bestselling book, The Leadership Challenge, by Barry Posner and Jim Kouzes, the workshop is a unique, intensive leadership development program for all levels of management. During this fast-paced workshop, participants explore the proven practices of leadership, most frequently associated with leaders at their best. 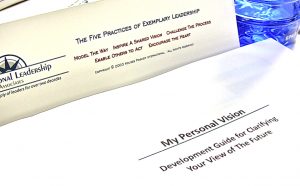 They also receive extensive feedback on their current leadership behaviors from the Leadership Practices Inventory®. Long hours, hard work, uplifting celebration and rich development of close relationships make The Leadership Challenge® a memorable experience. The Leadership Challenge® Workshop liberates the leader in each of us. How participants learn directly impacts what they learn, and how they can best apply it!